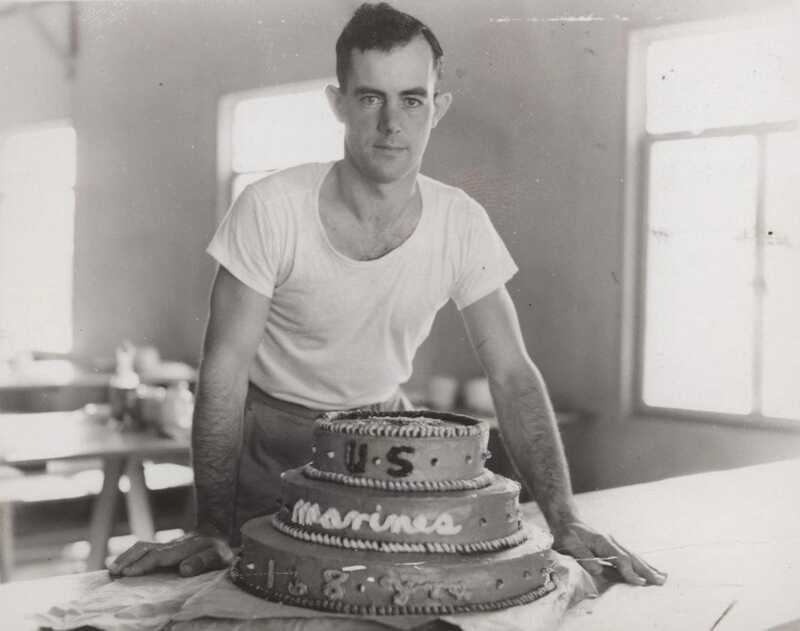 US Marine Corps photoA Marine field cook, stationed in Bermuda, with a cake he made for the Marine Corps’ birthday in 1943. The US Marine Corps turned 242 years old on November 10. 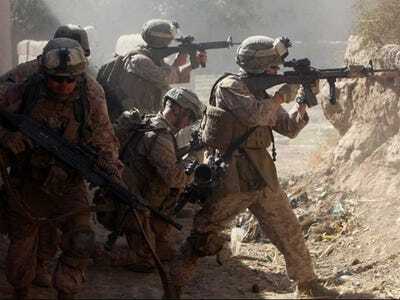 “At places like Trenton, Tripoli, Chapultepec, Belleau Wood, Guadalcanal, Chosin, Khe Sanh, Fallujah, Sangin, and so many others, Marines have fought with an inner spirit — a spirit that bonds us, binds us together as a cohesive team. It’s that intangible spirit that has formed the foundation of our warfighting reputation for the past 242 years,” Marine Corps Commandant Gen. Robert Neller said in a message this year. 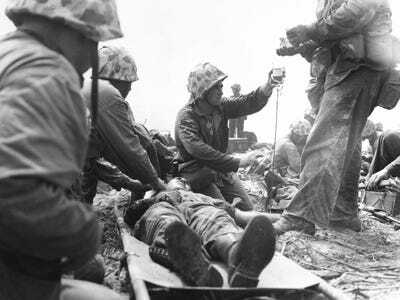 Below, you can see some of the best photos from the Marine Corps’ storied history, pulled from its archives. Amanda Macias composed an earlier version of this post. Created in 1798, the Marine Corps band was called 'The President's Own' by President Thomas Jefferson during his inaugural ball. Since then, it has played at every presidential inauguration. 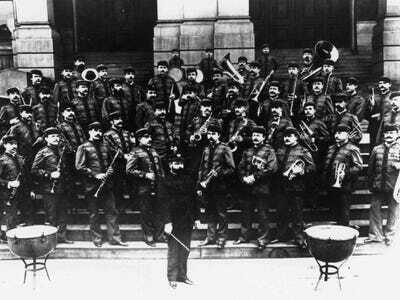 Here's the band in 1893. In the early 1900s, Marines were active in China and in the Philippines. 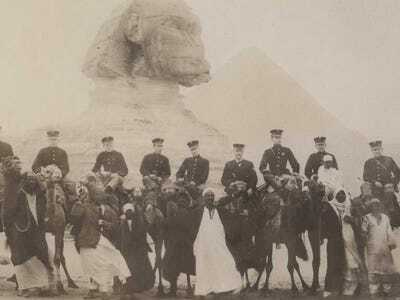 This photo, from 1907, shows Marines in front of the Sphinx in Egypt. 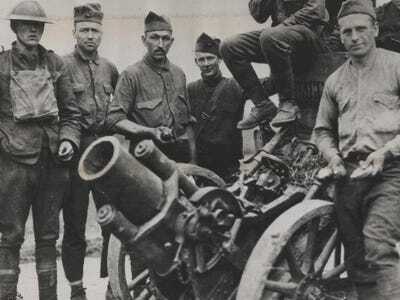 These Marines are posing with a German trench mortar captured in France in 1918. Mortars were especially useful because a mortar round could be aimed to fall directly into the trenches that criss-crossed World War I battlefields. 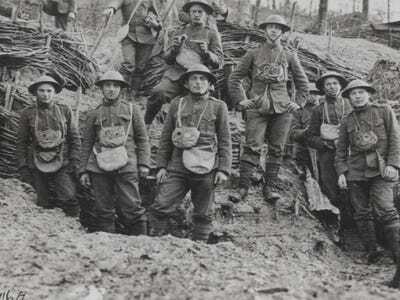 Marines wearing gas masks in France in 1918. About 2,400 Marines died in World War I. 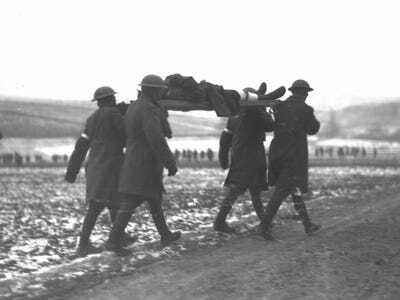 Here, Marines practice carrying a wounded comrade in western Germany sometime around 1918. Marine Corps experimentation with aviation began in conjunction with the Navy around 1919. 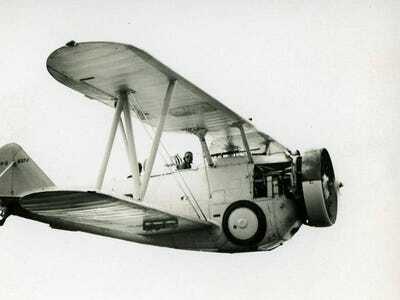 This 1930 photo shows a Marine flying a Grumman FF-2 Navy plane. Within a decade the Marines had its first aircraft wing, which is now based in Okinawa, Japan. Japan's surprise attack on Pearl Harbour in 1941 brought the US into World War II. This photo shows a Marine with a piece of shrapnel removed from his arm after the attack. 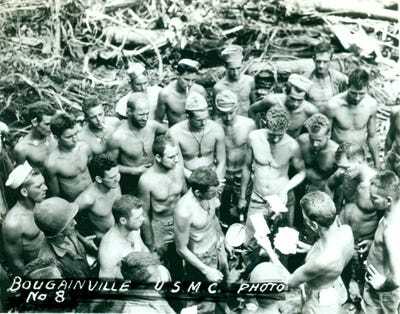 Allied efforts to dislodge the Japanese from islands in the Pacific started with the Marines' deployment to the tropical island of Guadalcanal. 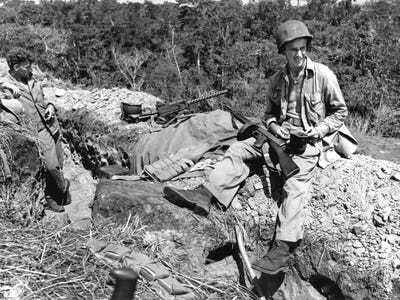 This photo shows two Marines waiting for 'chow call,' or mealtime, in 1943. 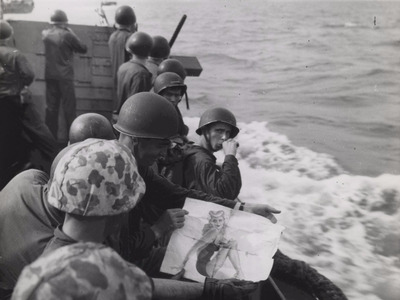 Marines on a landing barge take one last look at a 'good-luck picture' of a pin-up girl in 1943 as they approach the Japanese-held island of Tarawa in the Pacific. 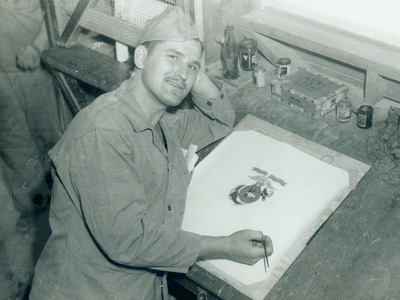 In this 1943 photo, James Wrobel designs the insignia for Marine Fighter Squadron 312. The official Marine Corps emblem has an eagle, a globe, and an anchor. The eagle represents readiness and precision. The globe represents the Corps' worldwide presence. The anchor reflects the Corps' naval heritage and ability to access any coastline in the world. 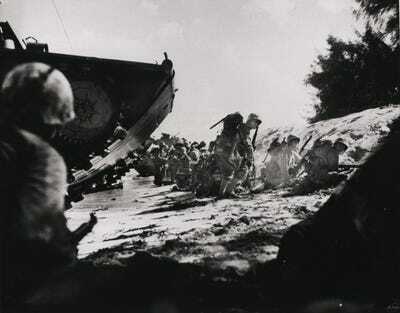 Here, Marines land on the Japanese-held island of Saipan in 1944. Amphibious warfare has been a mainstay of the Corps' operations. 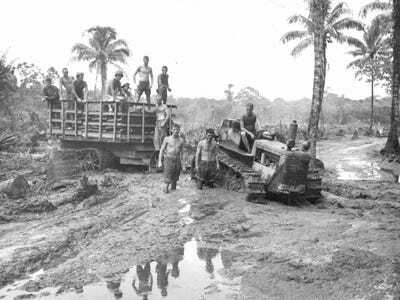 Here, Marines on the South Pacific island of Bougainville slog through thick mud to get ammunition to the front line. Marines on Bougainville get letters from home. Marines from the Navajo tribe used their native language to send coded radio transmissions to units overseas. 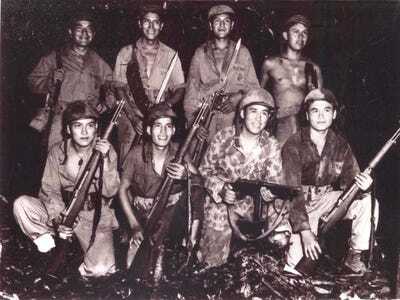 Navajo code talkers, like the ones below, seen in 1943, were said to be faster and more accurate than Morse Code. Intercepted Navajo codes were never successfully deciphered by the enemy. 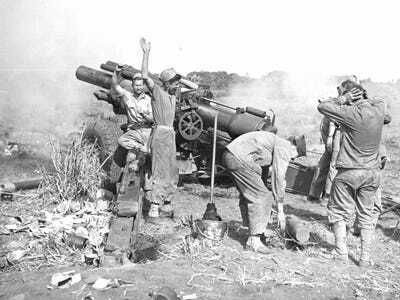 Marine artillerymen wearing barely any protective gear plug their ears while firing a 155 mm howitzer on northern Iwo Jima. 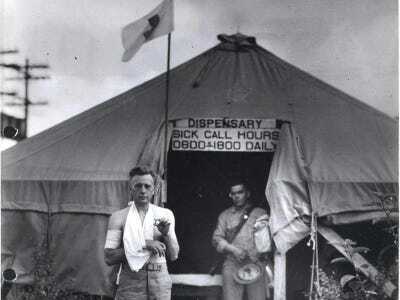 This photo shows a Navy corpsman giving a wounded Marine blood plasma on an island in the Pacific in 1944. Iwo Jima was a vital base for US forces to launch air raids on Japan, but it was fiercely defended by Japanese forces. 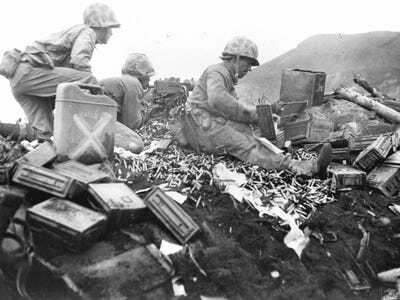 Here, Marines battle at the foot of Mount Suribachi. 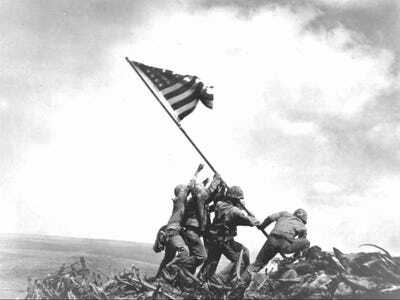 Marines raise the American flag at the top of Mount Suribachi in 1945. This photo actually shows the second flag raised on the mountain that day. The first flag was too small to be seen easily. 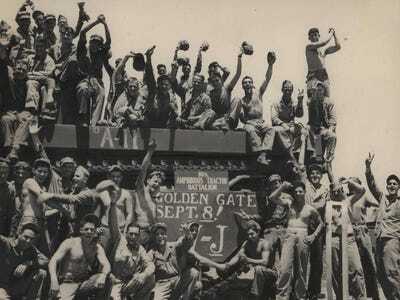 Marines seen here atop an amphibian tractor celebrate the end of World War II and 'Victory over Japan Day' in 1945. 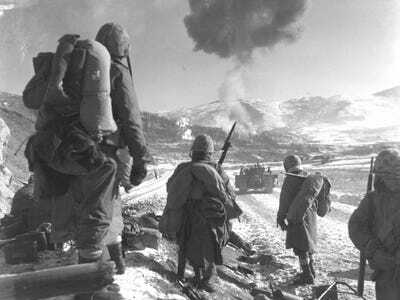 The North Korean invasion of South Korea brought the US into the Korean War. This 1950 photo shows Marine air and ground units during the war. 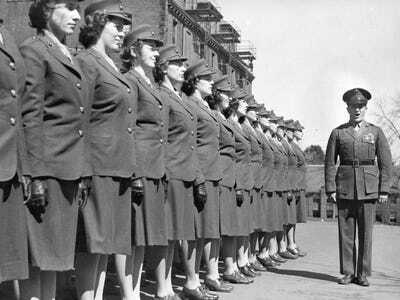 In the US, women began training at the Marine Corps Recruit Depot in Parris Island, South Carolina, in 1949. All female recruits are still trained at Parris Island. 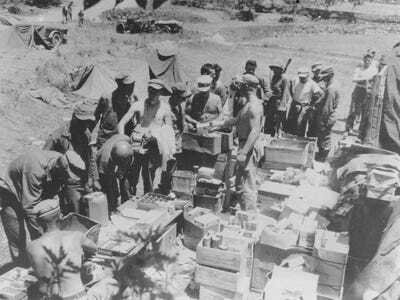 Marines line up at a makeshift Post Exchange in Korea to get comfort items like candy, cigarettes, and soft drinks. The Vietnam War was the next major US conflict. 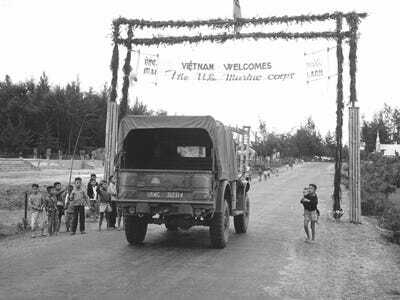 This Marine truck is passing under a welcome banner at the entrance to Da Nang in Vietnam in 1965. Marines scatter away from a CH-46 helicopter that is exploding after it was shot down during combat in Vietnam. At least 13 Marines were reported killed in the crash, with another three badly burned. Khe Sanh, in southern Vietnam, faced the heaviest rocket and artillery attacks from the North Vietnamese. The Marine below was stationed there in 1968. 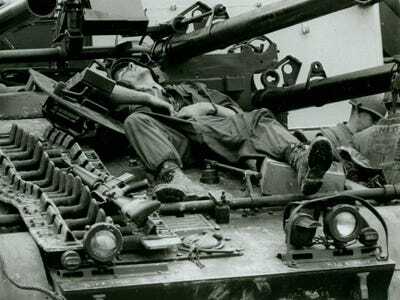 Here, an exhausted Marine takes a quick break from fighting in Hue in 1968. Marine Cpl. 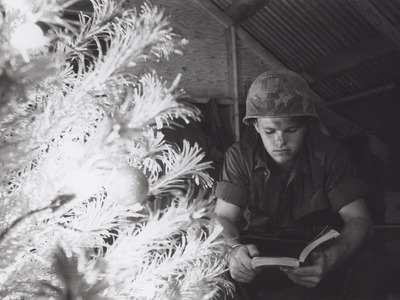 Larry Nabb reads next to a Christmas tree at Quang Tri Combat Base, Vietnam, in 1968. 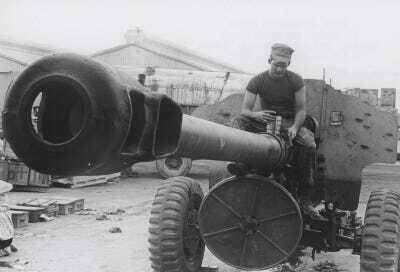 A Marine dismantles a 122 mm field gun that was captured during battle in 1969. 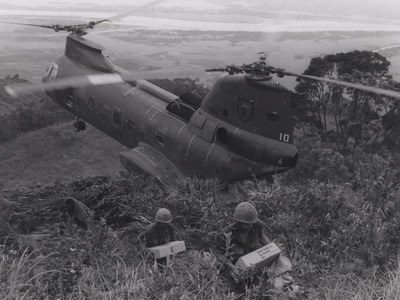 Marines carry supplies from a cargo helicopter to their temporary base near Da Nang in 1969. 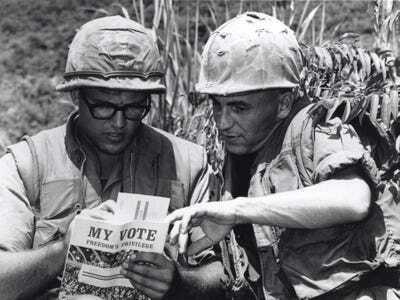 A Marine fills out his voter-registration card ahead of the 1968 presidential election. In 1983, the US embassy in Beirut was bombed by Islamic terrorists. At the time, it was the deadliest attack on a US diplomatic mission. This photo shows a Marine wearing a gas mask while digging through the rubble to find survivors. 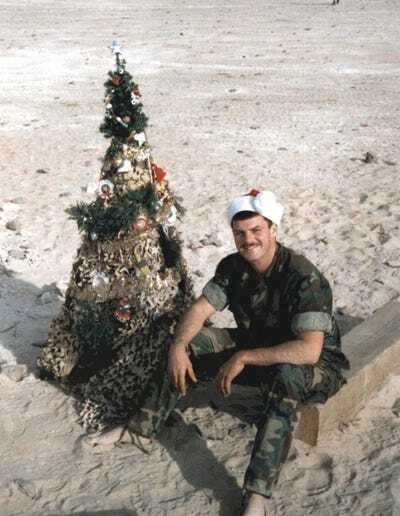 In this photo from 1990, Marine David Gurfein sits next to a Christmas tree in Saudi Arabia during Operation Desert Storm. 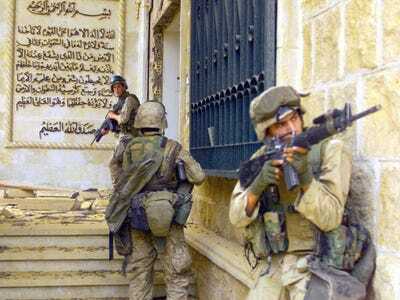 Marines cover each other as they prepare to enter one of Saddam Hussein's palaces in Baghdad during Operation Iraqi Freedom in 2003. In this iconic photo, a Marine looks on as a statue of Saddam Hussein is pulled down in central Baghdad's Firdaus Square on April 9, 2003. 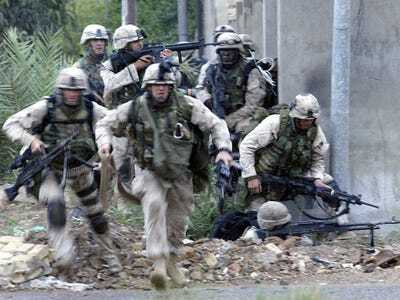 One of fiercest Marine battles in Iraq was in Fallujah, known as the 'city of mosques,' in 2004. 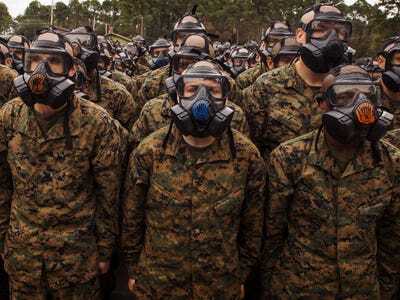 It was the only battle in Marine Corps history where leaflets were dropped to alert civilians that troops were coming and to unnerve the enemy. Marine Lance Cpl. 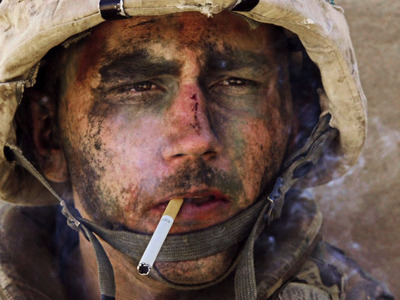 James Blake Miller, dubbed the 'Marlboro Marine,' became the face of the Iraq War after his photo was taken by a Los Angeles Times reporter in Fallujah in 2004. The 'Darkhorse' Marines in the 3rd Battalion, 5th Regiment, suffered the highest casualty rate of any Marine unit deployed to Helmand province in southern Afghanistan, following the heavy Marine-led assault on Marjah. Here, some members of the unit are under enemy sniper fire in 2010. The Marine Corps also trains to fight and survive in water. Here, Marines conduct an underwater gear shed during a basic swim qualification course at Marine Corps Air Station Cherry Point, North Carolina, on March 16, 2016. 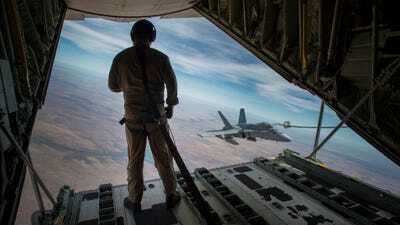 Marines also train to operate in the air. Here, a crew master observes an F/A-18C Hornet approach a refuelling hose during Exercise Pitch Black 2016 at Royal Australian Air Force Base Tindal on August 9, 2016. Built in 1861, the Marine Corps Recruit Depot in Parris Island consists of 8,095 acres of various types of terrain for the recruits to use as their learning facility. About 20,000 recruits are trained here every year. 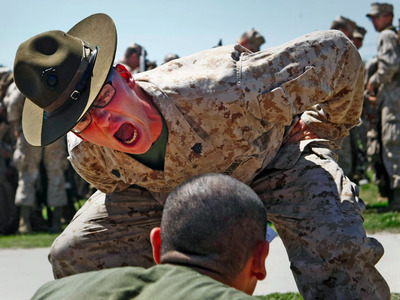 Every recruit received at Parris Island is transformed by legendary Marine drill instructors like the one pictured here. Marine recruits are typically younger than those in the Corps' sister-service branches, and each DI wants to ensure they can survive combat. Today, more than 200,000 active-duty and reserve Marines are serving air, land, and sea. 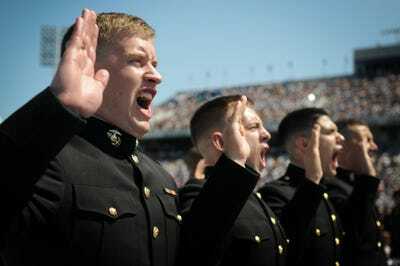 The Marines pictured here respond, 'I do' during the oath of office at the US Naval Academy Class of 2012 graduation and commissioning ceremony.